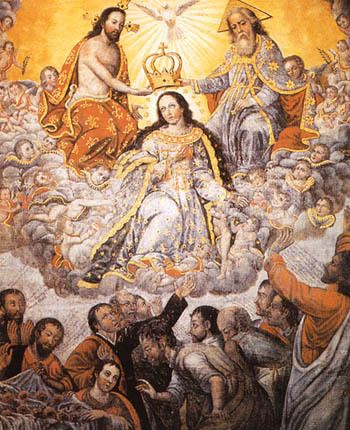 The queenship of Our Lady is supernatural in character because she is the first and highest of the creatures of God. She is not the first in the order of nature, for the Angels are more than she. An angel is a pure spirit and, therefore, more than a human creature. But she is the first creature in the order of grace. That is, she received incomparably more graces than the Angels. The graces the Angels received are subordinate to the graces Our Lady received. She is also the first of all women. The first of all men is Our Lord Jesus Christ; the first of women is Our Lady. This alone would suffice to give her the right to queenship. For royalty is a de jure state from which flows a de facto situation. One who is first has the right to command and be served, and especially when her queenship is linked to an eternal queenship that will never end. This defines her queenship. Our Lady is the first of creatures because she is the Mother of God. No one has had or can have a union with the Most Holy Trinity as close as hers. She is the Most Beloved Daughter of the Eternal Father, the Most Admirable Mother of the Eternal Word, and the Most Faithful Spouse of the Holy Ghost. Further, she is Queen because God placed the government of all things in her hands. God does not do any supernatural thing on earth that does not pass through her. All the prayers that are raised from earth to Heaven pass through her; all the graces that come from God to earth are at her request. If all Heaven were to implore something without her intercession, it would not be attained; and if she alone among the citizens of Heaven would ask for something, she would obtain all she asked for. This makes her a Queen in the plenitude of the term. He considered himself just an executor of the will of God, even though he was one of the most powerful monarchs of his time. He understood his mission well, because actually this is what each King should be. The same should apply to Our Lady. Kings and rulers should be her captains. Now, what is the will of Our Lady? Since she does not appear in mystical ways to communicate with us, how can we know her will? Above all other things, the will of Our Lady lies in Catholic doctrine and in obedience to the Catholic Church as she always was. In essence, this is the will of Our Lady, because her will coincides with the will of God. Obedience to the Catholic Church is, therefore, the clearest and most indisputable component of the will of Our Lady. But there is another factor, which is the voice of grace in us. Grace indicates to each person a way to follow it in order to achieve God’s plan for him or her. This is what is commonly called the vocation of a person. The vocation is the call of God, the call of Our Lady, to fulfill that pre-established plan they have for each one of us. Therefore, to correspond to one’s vocation is also to accomplish the will of Our Lady. How should one correspond to his or her vocation? It is to do everything that one can to preserve the deposit of Catholic doctrine as it was always taught by Holy Mother Church. Now then, since Vatican II this deposit of Faith, Morals, Liturgy and Canon Law has been systematically attacked by the enemies of the Church who infiltrated inside her and replaced her doctrine with quite different new teachings. So, obedience to one’s vocation implies the defense of this deposit from the enemies who attack it. Therefore, to be faithful to the call of Our Lady, we must fight to destroy her enemies in our days. There is another point that still needs to be addressed. If to carry out the will of Our Lady is to follow the will of the Church, one could affirm that the Middle Ages was already the Reign of Mary. Why do we expect a future Reign of Mary? I think that if the Middle Ages had not deteriorated, it would have become the Reign of Mary. 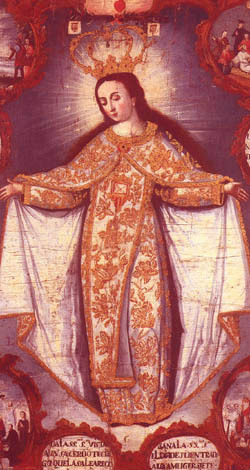 We can see that devotion to Our Lady was growing at the height of the Middle Ages. Then, it started to decline. A plan of God was interrupted. Many of the truths about Our Lady had not yet been elucidated; many of the great Doctors of Our Lady had not taken Mariology to the higher levels it later attained. For instance, the great voice of St. Louis Grignion de Monfort had not yet been heard; slavery to Our Lady – defined by him as true devotion to Mary – had not been explained. 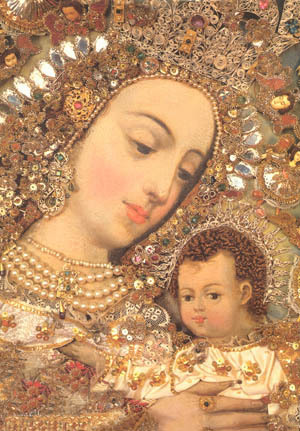 Above all, the truth of the universal mediation of Our Lady had not been taught. These truths would have been discovered and taught to all Catholics if the Middle Ages had not fallen. But this is not what happened. The Middle Ages fell. So, these truths came to light in a different way, without being properly reflected in the social sphere. They were not applied to all of society as they should have been. For the fullest glory of God on earth, it is necessary that His plan be fully executed here. That is, it is necessary for the royalty of Our Lady to be established on earth based upon these truths and still others that will come. These are the principles that explain the full meaning of the Queenship of Our Lady, whose feast is today.